Our February meeting was extremely informational and Harry Appel did a recap from the Florida State Permit Holder Meeting that was held in St. Augistine. He had multiple photos and talked about some of the beaches that they visited on the way to and from the meeting. If you missed this meeting, we have included some of the information in this months newsletter. Keep your eye out for our next Newsletter which will feature a photo and small bio for each of our board members! Follow us on Big Pine for more information on these events! Save A Turtle will be attending Mote's Ocean Fest on April 14th at the Eco Discovery Center in Key West. We plan on hosting a very special event for the kids! Details will be coming soon!! 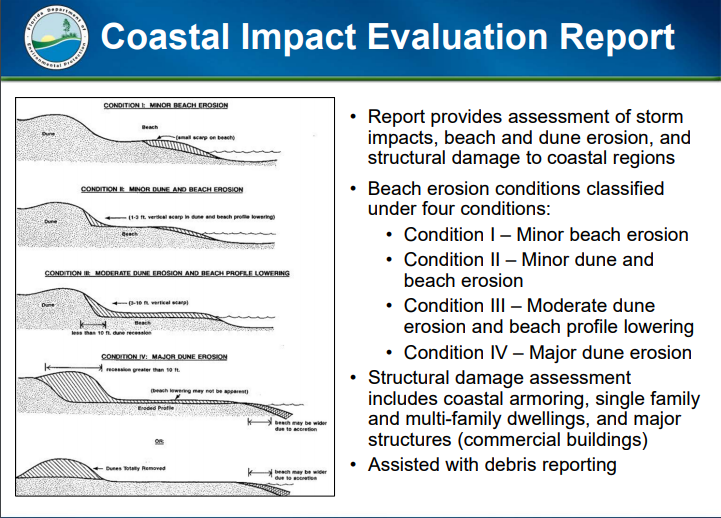 While some areas in Florida experienced extreme erosion and massive property damage, there remain areas in Florida that are “conserved” property like this shown here. This is what a healthy dune system should look like. While we don’t have dunes like this in the Keys, we do have a dune system. 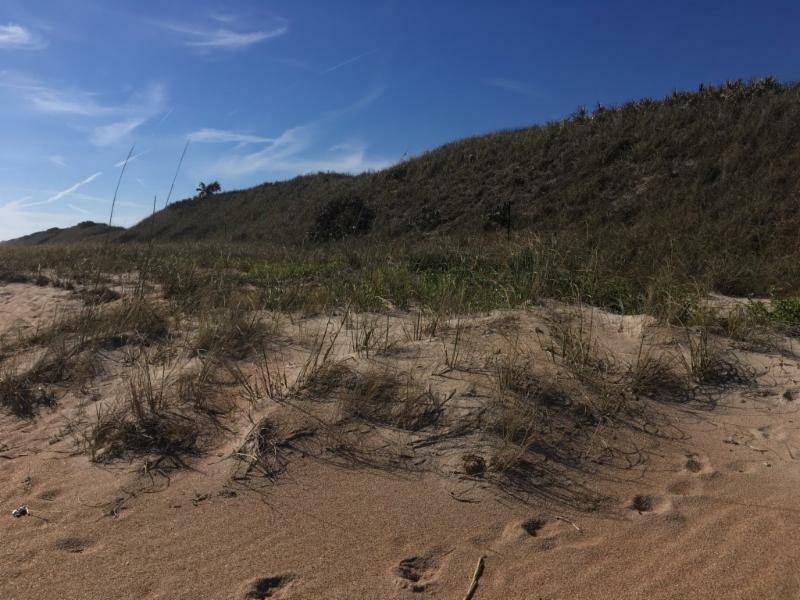 Dunes are critical to preserving and protecting natural environment, habitat for land and marine animals including sea turtles, as well protecting human development when properly done. 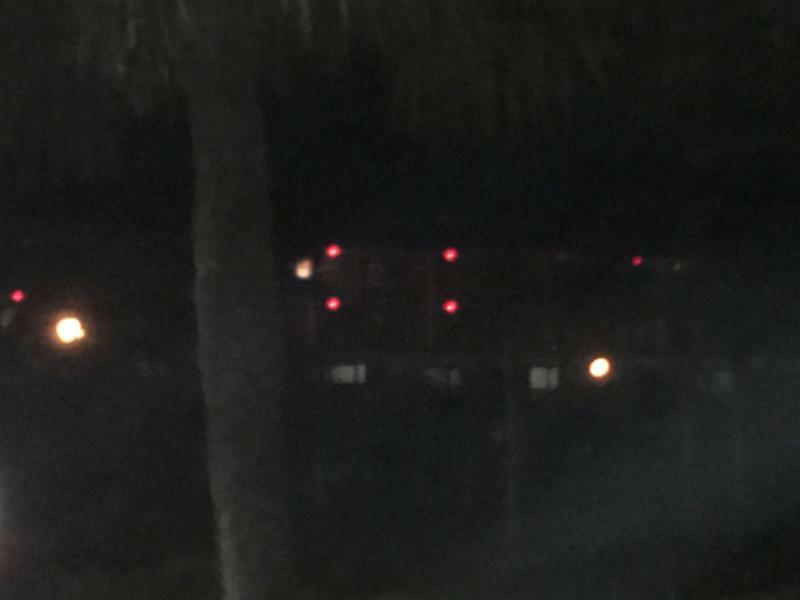 Some people have completely eradicated dune systems, including in the Keys, for landscaping purposes, to obtain “better views” or just out of sheer ignorance. It is situations like that when a bad situation (like Irma) can be even worse for destruction. ﻿Our permit holders were treated to this beautiful view of a double dune system while visiting other sea turtle nesting areas in the State on the way to the annual Permit Holder’s Conference. 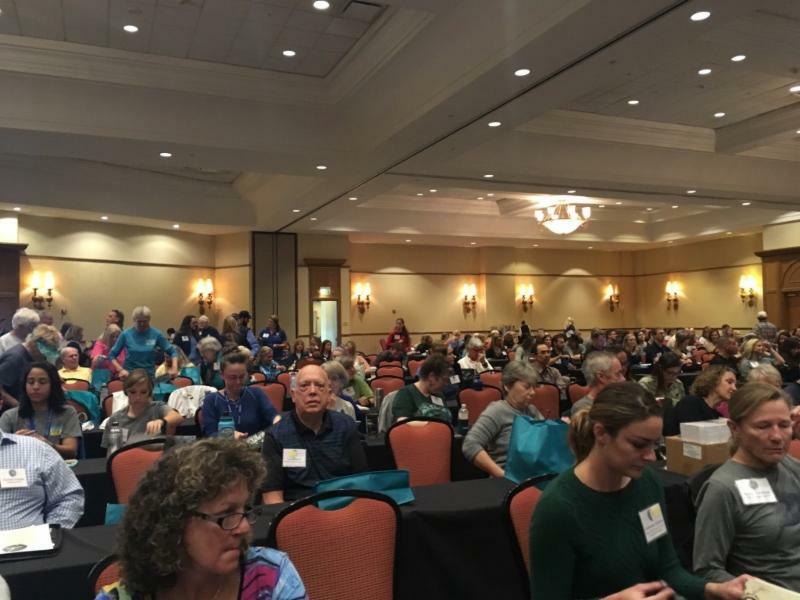 The annual Marine Turtle Permit Holder Conference was held early February in St. Augustine, Florida. All Keys permit holders attended the Conference. This Conference is crucial and assists all main permit holders in learning about any changes in law, regulations and codes State-wide, as well as attending presentations, lectures and roundtables on many issues regarding marine turtles and their environment. 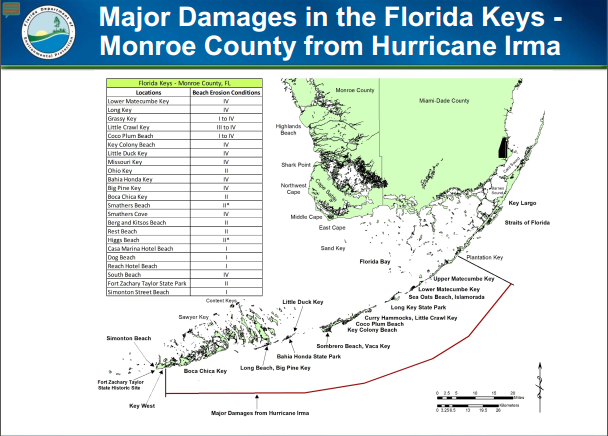 This year, Guy Weeks, DEP/Florida offered a wonderful presentation about Shoreline storm damage from Irma Also, the resource manager from Broward County presented on Broward’s excellent protections of habitat in general, including sea turtle habitat. This includes major education efforts that are highly effective in protecting sea turtles from illegal and inappropriate artificial lighting. 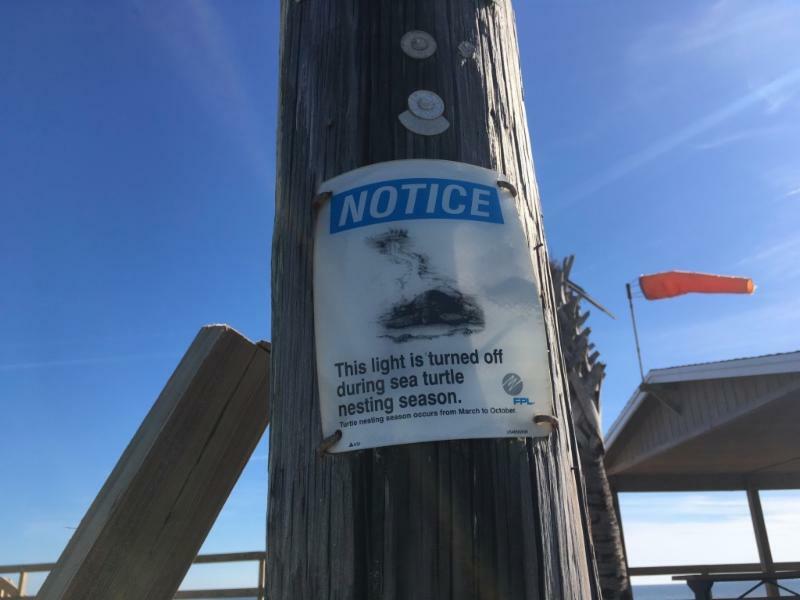 Signs are everywhere on beaches, poles and throughout developments reminding people about “lights out for sea turtles” and many signs also offer up the specific codes that regulate those protections. 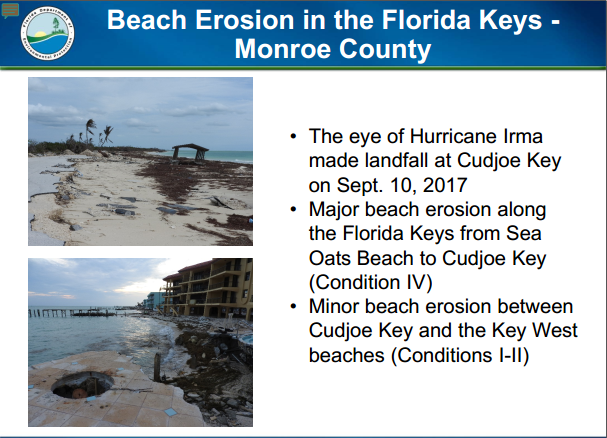 The beaches in St. Johns County sustained major flooding and erosion during Hurricane Matthew in 2016. 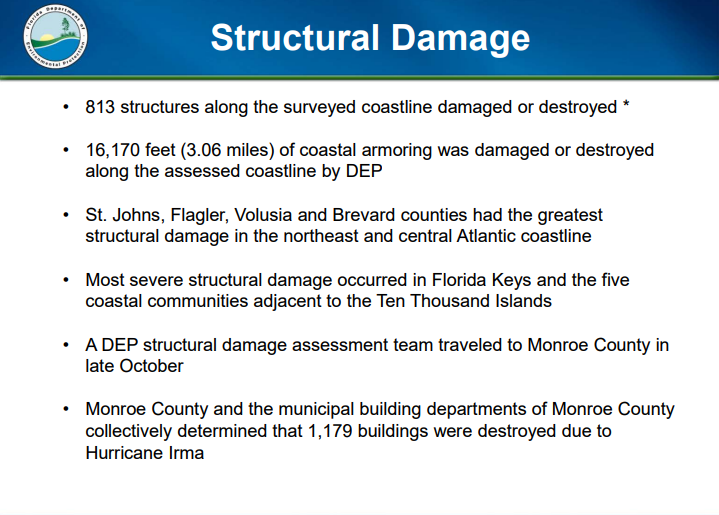 Unfortunately, many areas did not have time to recover fully before the 2017 hurricane season, and when Irma came ashore as a Cat 3 in St. Augustine, a bad situation got even worse. 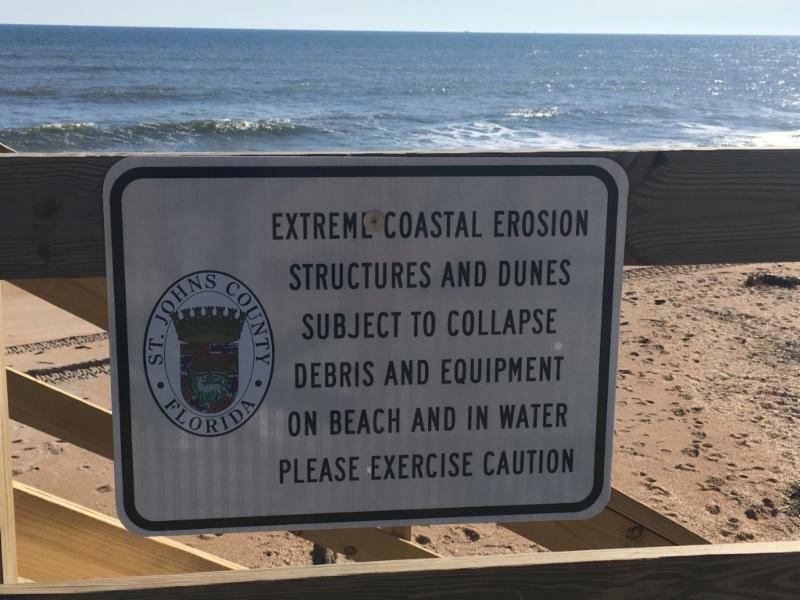 We saw signs like this in many areas around St. John’s County (and other areas) with complete washouts underneath structures (homes) that collapsed, “cliffs” of sand left behind where a thriving beach ecosystem previously existed, and areas that were off limits to people completely. 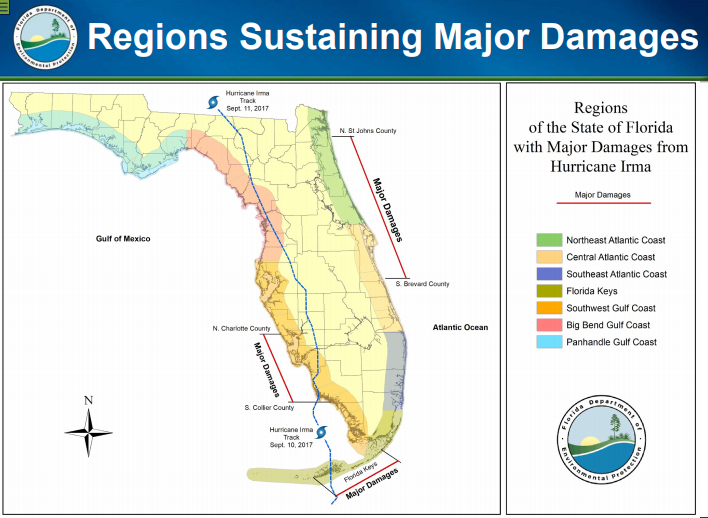 Major efforts are being made to restore habitat in many areas of the State, including the Florida Keys. 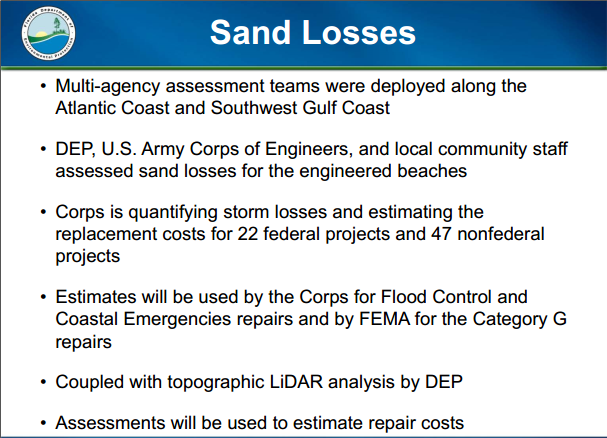 Harry Appel, President of Save-A-Turtle attended a roundtable discussion at the Permit Holder’s Conference regarding beach renourishment and funding that hopefully will become available through the Keys to help rebuild the decimated beaches. ﻿This will not be in time for the 2018 sea turtle nesting season in the Keys, but the turtles will still come ashore, and our surveyors will be out everyday of course. 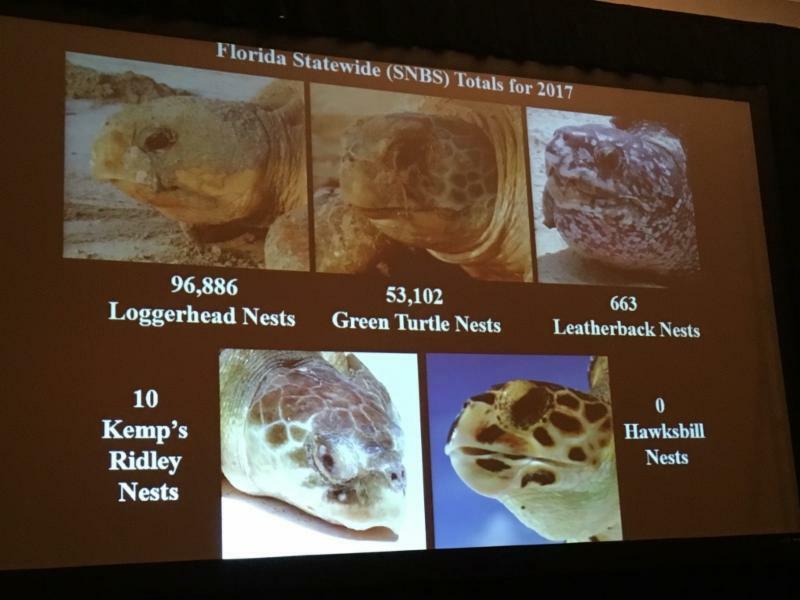 This image from a slide at the Marine Turtle Permit Holder’s Conference shows the nests as they were, and do not speak to the issues of nest washouts due to Hurricane Irma. The leatherback nests plummeted for the year 2017, they are not doing well at all. The Conference was again sold out this year, this picture shows a fraction of the presence in the Conference area at the hotel! Sea turtle angels for the win!!! 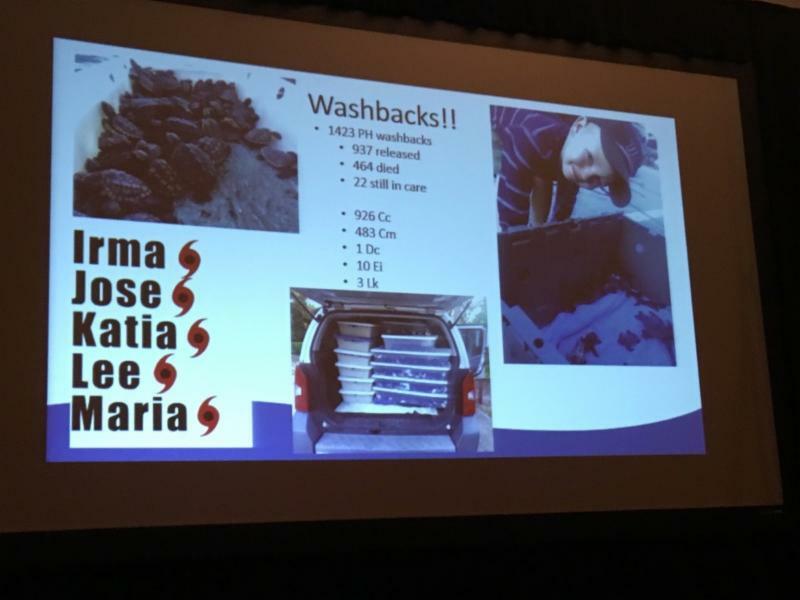 This slide from the presentation speaks for itself in regards to wash back. The numbers with the abriviations is seperating the turtles by their scientific name. 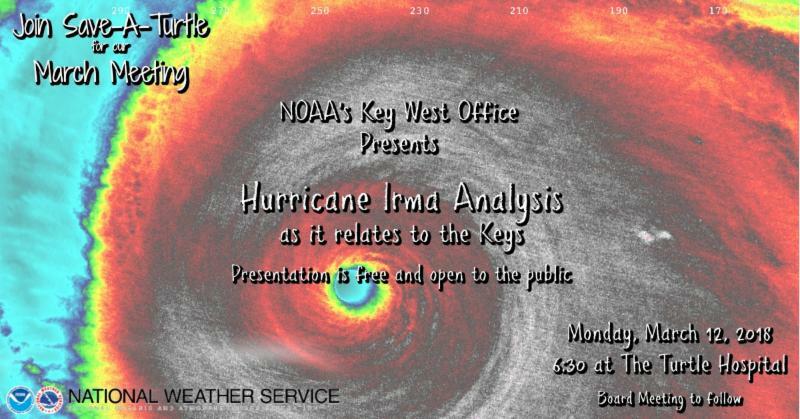 The next few slides are from the presentation, we selected a few that were impactful to Florida keys. The 2018 nesting season is quickly approaching and we wanted to do a "Spot Light" on some of the beaches around the state that are doing some really great things for our turtles, and the enviroment. Flippers up for all the great progress! 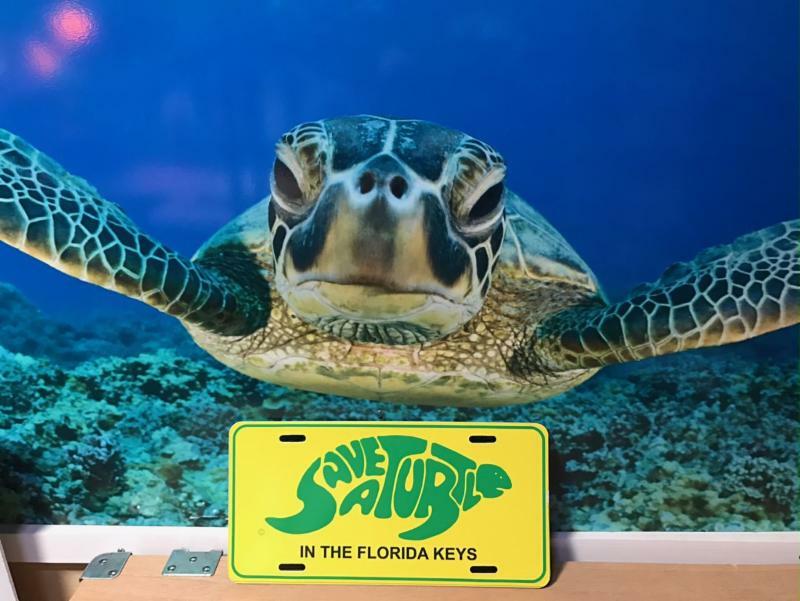 Lets help make the Keys Beaches ready for the turtles who come here to nest. The impacts of Irma have been felt throughout the community and we have unfortunitly lost some of our beach walkers from this impact. With the destruction to our beaches, and the loss of our supplies, we now more than ever need your help. If you are interested in becoming a beach walker, or already are, please press the button below, this will allow us to create a mailing list just for beach walkers. You also will need to attend a training on April 19th. By sponsoring a beach walker you would be able to help cover the costs of the shirt, and supplies needed to protect the nests.